The very first ancient documents about plants (Babylonian souces, the Old Testament, HOMER's works) that came down on us regarded plants mainly under the aspects of utility and medicinal use. The interest of the old Greek philosophers focused more on the comparison of animal and man on one hand and plants on the other. EMPEDOCLES FROM AGRIENT, for example, dwelt on the question whether plants have a soul while ARISTOTLE ranks them in the middle between the inanimate and the animate. THEOPHRASTUS wrote two works of a general nature on plants: The Natural History of Plants and About the Reasons of Vegetable Growth . Both had a formative influence on the botanical research of following scientists. An estimated 1300-1400 different plant species were known under Roman reign. The interest of the Romans concentrated more on practical problems: PLINY THE OLDER reviewed plants mainly under aspects of utility while the work of DIOSKORIDE on pharmacology gained him the reputation as the superior authority on this subject for more than sixteen centuries to come. He describes more than 500 different plant species. No further knowledge was gained during the Middle Ages though Europe was confronted with the works and thoughts of antiquity through the Arab reign. The first original observations were made by HILDEGARD von BINGEN, but it is ALBERT THE GREAT who is regarded as the rediscoverer of scientific botany. His work had a large influence on Western scientific literature. New knowledge was also gained by the travellers and discoverers of the time, MARCO POLO, for example, and the crusades. The ideas of antiquity became popular again during the Renaissance, while the 17th and 18th century was the time of the beginning specialization. The attempt to find a natural system for the great variety of plant species led to decisive contributions to botany. At about the same time another field of modern biology, cell biology, took its beginning with the invention of the microscope. Since the 16th century physiology became a botanical topic, too. Botany is the science of plants. What does this mean? Is science what is worked on in laboratories or what is found out in field studies or is it something you can find in big libraries? All these are certainly aspects of science, but they do not present the whole picture. Science might be defined as an intellectual analysis of a given subject. It is the attempt to conclude from single observations to a general validity, to extrapolate from known to unknown and to have a look at different arguments. Plant science has a long history. It has -just like all human cultural science- no straight course, nor a declared aim: phases of profound gain of knowledge alternate with periods of ignorance. Especially during the last centuries, opinions have often been expressed with utter harshness, with polemics or even with personal defamation of people having different views, peaking maybe in G.GALILEI�s inquisition. Misinterpretation of results and corrections belong to the everyday-life of science. An accepted opion is one, that gains wide approval at a certain time. It has to be in accord with related opinions and observations and it must resist almost all attempts to prove it wrong. Differing results are often, and sometimes for very long periods, seen as "unimportant results" before they may be confirmed by a new hypothesis or by results that are gained with new methods and thus obtain a new complexion. The history of science is the history of a continuous process of learning. The occupation with plants and the development of human culture cannot be separated. Without plants, human and animal nutrition would not be possible and thus, they are of paramount importance. Since animals avoid poisonous or bitter plants instinctively or due to experience, the knowledge of nutritious plants precedes the cultural achievements of man. But the use of plants is not limited to food alone. They can also be used as tools or as building material. What then was the achievement of early human cultures and to what degree did they understand the use of plants? The crucial aspect seems to be the selection and cultivation of certain varieties, which generated new tasks. The developement of human settlements and new social structures were as important as the development of growing methods and the storage of the harvested goods. The understanding that higher yields could be gained by selection of suitable seed was the result of experience. It formed the basis of the cultivation of plants and resulted in cultivated varieties, that the greeks called "tame plants". Cultivated varieties began to differ more and more from the wild types. Among the first cultivated plants were a number of graminaceous plants, the cereals, that continue to be the most important cultivated plants until today. Unprocessed, their seeds are difficult to digest and the question of how to make them edible must have been a challenge to the human mind. But cereals were not the only cultivated plants. Early artwork and documents show us, that man used a wide variety of plant species and that the experience to use them for special purposes was well developed already rather early in human history. Advice on how to prepare the soil can be found in ancient Babylonian documents, where instruction is given, too, about how to improve seeds, trees and fruits and how to protect plants from damage. Great store was set especially by the description of poisons and the exploitation of medicinal plants. 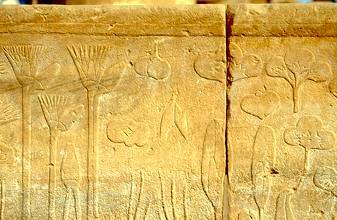 To the left: a relief in the temple of Luxor (Upper Egypt) showing papyrus and lotus. 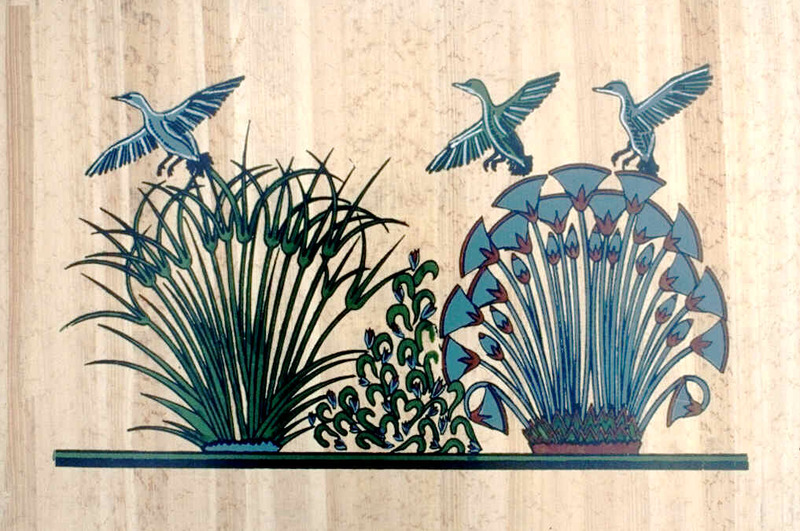 To the right: ducks, papyrus and lotus. The original painting is an exhibit of the Egypt Museum in Cairo, while this picture shows a modern reproduction drawn on papyrus. The Egyptians produced paper out of the pith of papyrus (Cyperus papyrus), but papyrus was not only used for the production of paper. It was needed for the wreathes of kings and gods, too. 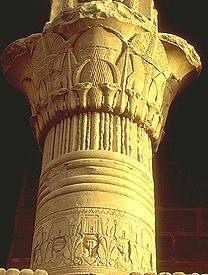 Beside this, it served as a model for the columns of the temples in Upper Egypt and was often seen to decorate their reliefs. The Egyptians knew initially only spring wheat; winter wheat being cultivated from spring wheat only much later. They knew also olive trees, grapevines and fig trees, the latter giving tasty fruit, but only bad building timber. Plants were not only looked at from the point of view of utility. Special powers were attributed to them and some were even considered holy. Lotus (Nelumbo nucifera), for example, was sacred to the ancient Egyptians, to the Hindus and to other people of the east. They did nevertheless eat the lotus fruits: these were forbidden only to Egyptian priests. In many ancient tales, plants were seen as symbols of gentle and delicate feelings and in all cultures the beauty and transitory nature of flowers was noticed and attributed emotional values. Only few depictions of plants by the Greeks or the Romans were handed down on us, but plants were very often subjects of their mythology. The creation of plants was connected to the myths of gods. The Spartan HYACINTHOS, for example, was loved by APPOLON and, when accidentally killed by the god, was turned into a flower with the same name. This happened to NARCISSOS, too, who committed suicide after falling in love with his own reflection. The Heliads, daughters of the sun, were transformed into electron (amber)-excreting poplars. HOMER distinguishes clearly between wild and cultivated varieties, though his knowledge of plants was confined to the useable species of Asia Minor. Among the most important cultivated plants of Greece and Asia Minor was the olive tree. It was said to have been brought to Greece from the Caucasus by PROMETHEUS. Medicinal plants had outstanding importance in ancient Greece. They were collected by rhizotoms, who operated with superstition and alledged witchcraft. The direction of the wind, the hour of the day or the night decided about the success of their mission. Dances and prayers, and often also obscene comments went with the search. The most skilful rhizotom according to THEOPHRASTUS was THYRASYAS OF MANTINEA. He was preoccupied with the preparation of poison out of poppy sap and hemlock and he found out that one and the same plant can be sometimes poisonous and sometimes medicinal, depending on the constitution of the treated body.